Natural Stone Countertops: Why are they Beneficial? No one is going to tell you that natural stone countertops are inexpensive, but an investment of white marble, granite, quartzite, or quartz countertops will not be one that you will ever regret. Natural stone and durable engineered stones like quartz cost more than cheaper engineered materials for a reason - they are durable and last so much longer and are a much better long-term investment than other alternatives. Slabmarket sees a high demand for all natural stone countertops because they are durable and an installation of natural stone increases the resale value and appeal factor of a home immediately. When determining what type of stone you want to install, you should consider a number of factors, but the most important factor is the type of traffic that your kitchen will receive. While the look of a White Statuario marble kitchen island is so visually striking, it does not come without considerable maintenance. White marble is beautiful, it is a porous material that will etch over time when exposed to acids like vinegar or lemon juice. Viscont White granite or Super White quartzite are great alternatives to marble that provide a similar light clean look. Marble requires sealing up to 4 times a year while granite only needs to be sealed 1-2 times a year for optimal performance. You can clean marble, granite, and quartzite with a simple mix of soap and water or use a cleaner specifically designed to clean and seal natural stone countertops like AGM Daily Countertop Cleaner from Mr.Stone. There is also a high demand for quality quartz like Venastone quartz in the natural stone industry. Quartz is an engineered stone that is composed of quartz crystals and resin. It is extremely durable and requires next to no maintenance. Unlike natural stones that require frequent sealing, quartz does not require any sealing. Vena Carrara quartz is one of the quartz types available that mimics the look of marble. Since quartz is engineered, there is a much wider variety with regard to colors and pigments available, but currently, the natural stone industry sees such a high demand for the white quartz slabs that mimic the look of white marble. For natural stone purists, they may not be drawn to the quartz stones as they are not as unpredictable and unique as a slab of natural stone. There are so many different natural stones to choose from that we at SlabMarket recommend that slab yards maintain a wide and varied inventory of slabs to best serve their customers. White stones, mid-range beige stones, and dark stones are all popular as well as more exotic and rare colored stones, so it is not enough to simply fill a slab yard with pieces of Statuario white marble, Vena Carrara quartz, and Viscont white granite to meet the high demand of white stone slabs. Customers will want to be able to view and touch a full range of stone colors and to see the varying details that can be found within a slab of natural stone from rich veins to dramatic speckling. Granite countertops continue to dominate the natural stone industry because of their strength and durability as well as the universal appeal when it comes to listing your home for sale. 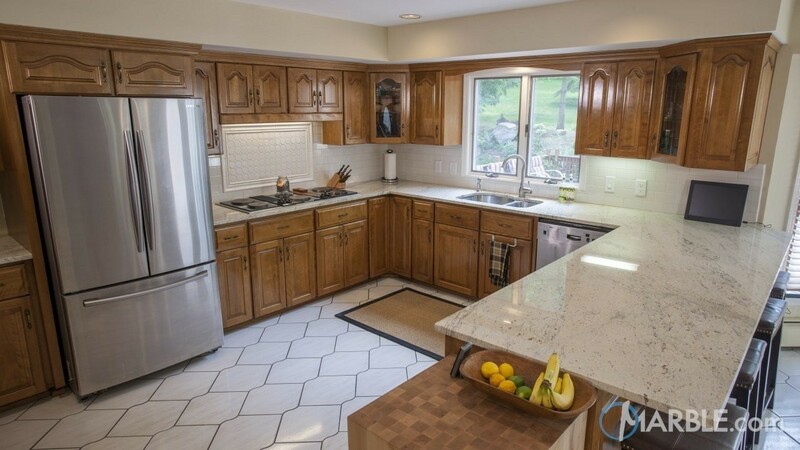 Quartzite countertops are nearly as strong as granite, and, consequently, are very popular. Natural stone countertops are typically so universal in look that they can work within every homeowner’s taste, and it is not uncommon to see a new homeowner change the colors and backsplashes within a room or the cabinetry while leaving the countertops intact. In fact, an installation of natural stone countertops can last up to 100 years with proper care and maintenance. Homeowners will often find that by changing the backsplash, paint colors, and cabinetry the stone’s colors will actually transform a bit as the surrounding colors might draw more focus on certain colors within the slab. Countertop fabricators should ensure that their inventory is wide and there is no worry about your natural stone slabs getting ruined being stored in your slab yard. The slabs will last up to 100 years, so, as long as you don’t go out of business, you will find a home for all the slabs in your yard.